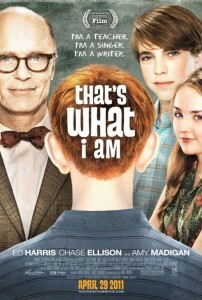 ‘Thats What I am’, is the latest WWE Studios release that will hit the screens on April 29, 2011. Ed Harris, Chase Ellison, Amy Madigan to be seen along with the WWE Superstar Randy Orton in WWE Studios’ “That’s What I Am,”. With this release, Randy Orton joins the rank with Dyawne Johnson, John Cena, Ted dibiase to star in a WWE productions. A coming-of-age story that follows 12-year-old Andy Nichol (Chase Ellison), a bright student who, like most kids his age, will do anything to avoid conflict for fear of suffering overwhelming ridicule and punishment from his junior high school peers. Everyone’s favorite teacher, Mr. Simon (Ed Harris), pairs Andy with the school’s biggest outcast and social pariah, Stanley, aka “Big G” (Alexander Walters) on a critical term project. When Andy watches “Big G” fearlessly confront the school bully, a series of events are triggered, which change the lives of both young men – and their teacher – forever. Much to Andy’s surprise “Big G” is brilliant, kind, tolerant and a decent human being, who has more dignity than anyone Andy has ever encountered. Shawn Michaels included for the honory WWE Hall of Fame 2011 awards! Kate Hudson Surprise 34th Birthday Party! Lou Reed Dies at 71! Next: US tornadoes forces 2 nuclear reactor shutdown! Porshe Being Sued For Paul Walker's Death! Egypt's Muslim Brotherhood Declared Terrorists! Cruise Ship Singer Mystery - Found Dead in Cabin!